With so many strawberries in so many kitchens this month, now is the perfect time to merge botany lab and breakfast preparation by working through the many parts of a strawberry. Once you have mastered berry dissection, I promise you will find it a surprisingly versatile skill. Having the confidence to steer a conversation towards strawberry anatomy can help you recover from one of the more awkward inevitabilities of summer – biting gracelessly through an enormous chocolate-covered strawberry just as you are introduced to the mother of the bride. After you have pointed out the veins and ovaries and have explained the developmental origin of the epicalyx, she won’t remember the red juice and bits of chocolate shell you have just dribbled down your frontside. Or so has been my experience. For this exercise, all you really need is a fresh strawberry (the fresher the better) and a small paring knife. Reading glasses or a hand lens might be helpful, too. 1. Examine the whole berry. The first thing to notice about a whole strawberry is its relationship to the flower it came from. The stem where it was attached to the plant was originally the stem holding up the flower; so if the stem is pointing up, you have to imagine a flower pointing downwards. 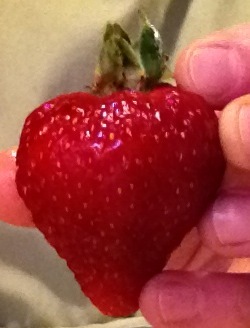 Or you can turn the berry stem-side down. 2. Look at the green fringe of sepals. This was always known by my sister and me as the “Kermit collar.” Sepals are the outermost ring of flower parts, and they often serve to protect the flower when it is still a bud. Together, the sepals are called a calyx. Although it looks like there are ten sepals in two alternating rings of five, there are not. 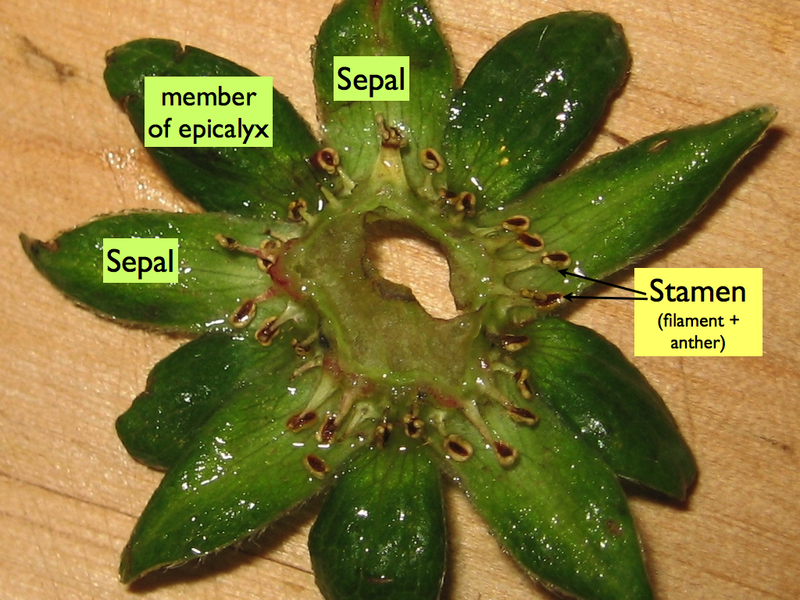 The outer ring is called an epicalyx and is actually composed of stipules, appendages of the sepals. Each sepal is flanked by two stipules, but the adjacent stipules from neighboring sepals fuse together, giving the impression that single stipules alternate with the sepals. (The whole rose family is characterized by stipules, which are easily seen as long flaps of tissue at the base of a rose leaf). Pulling back the sepals reveals rings of stamens. Pollen is made in the paddle-like anthers at the tips of the stamens. 3. Lift the sepals (calyx) to reveal the stamens. The next whorl of appendages in from the sepals is normally composed of petals, but these are gone by the time strawberries have matured. Rarely, a small detached mildewed white petal is still stuck on the berry somewhere. What you will definitely be able to see under the sepals is a couple of rings of stamens, which remain attached the calyx. Strawberry stamens are paddle-shaped, the wide part being the anthers, where pollen is produced. By now, the anthers will have opened up to shed their pollen, and the slits should be visible. If we follow the familiar botanical blueprint, we might start by guessing that the big red mound in the center of the strawberry flower has to be the mature ovary (the fruit.) But it is covered in tiny tan hard bits we usually call seeds. And we know perfectly well that seeds do not grow on the outside of a fruit. Making seeds on the outside of an ovary seems like a much bigger violation of expected developmental rules than producing an unexplained mound where we have gone looking for an ovary. If you look very closely at one of those “seeds,” you will see that it is tipped with a tiny pin-headed thread. (Click on the picture above to see the “seeds” up close.) That thread is a style leading to an ovary. Any pollen grain landing on the stigma – the pin-head top – could germinate and develop a tube to digest its way through the style to deliver a sperm cell to the egg cell in the ovary. 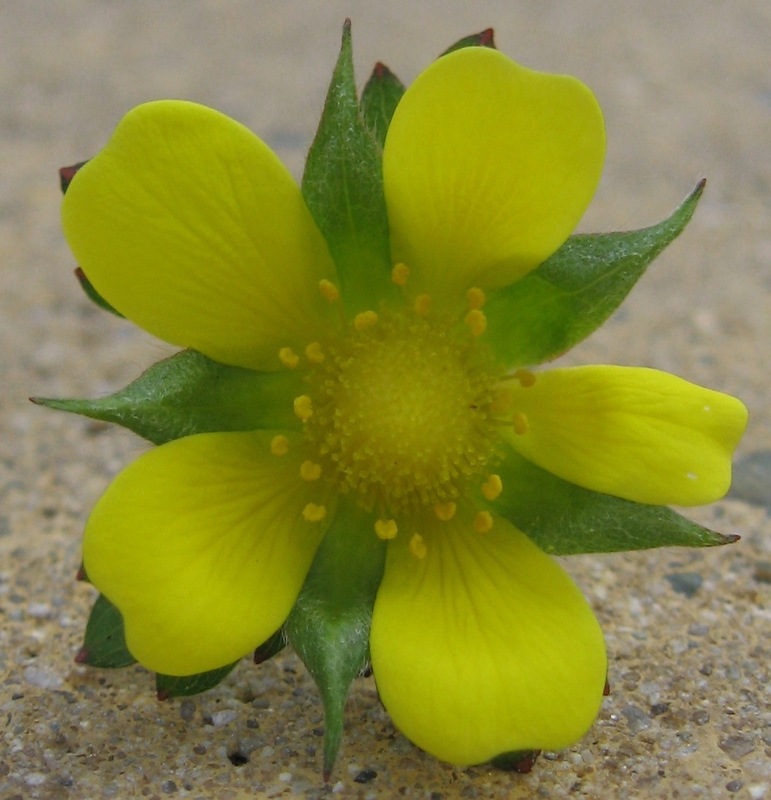 Indian Strawberry (Potentilla indica), showing green sepals, yellow petals, a double ring of paddle-shaped stamens, and the mound-like receptacle covered with hundreds of individual pistils (ovary, style, and stigma). Although this is a different species, it shows the same structures as a Fragaria flower would. 5. Finally, put the knife into the “berry.” Now that we know that the red mound is not the fruit, and that the real fruits are called achenes and not berries, we know that we are definitely getting at least 5 fruits a day if we eat strawberries. What we get from the red mound, though, is the sweet, tart, juicy, vitamin-packed object of our spring dreams. Botanically, the red mound is a very thick flower axis called a receptacle, upon which the sepals, petals, stamens, and pistils develop. 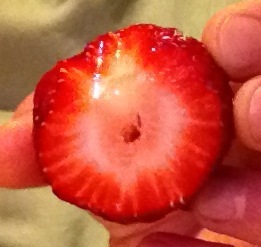 Cut off the “top” (where the calyx and epicalyx are) to reveal the inside of the strawberry. Notice the white lines running out to the surface of the receptacle where they feed directly into the achenes. Those are veins, feeding the developing seeds inside the achenes. The hollow center results when the outer part of the receptacle grows faster than the inner part. To summarize, then, a strawberry (not a berry) is a fleshy sweet floral axis (receptacle) covered in many separate dry fruits called achenes. It is conceptually helpful to contrast strawberries with the closely related caneberries (or brambles), which include blackberries and raspberries (Rubus species). Like strawberries, caneberries have an enlarged receptacle covered in individual fruits; however, unlike strawberries, caneberries have a dry, bland receptacle. In caneberries, it is the actual fruits that are fleshy and sweet. Although the fruits are not achenes, they are also not properly called berries. Caneberry fruits have a fleshy mesocarp (“middle fruit”) surrounding a pit (a stony endocarp), containing a single seed. They are essentially miniature plums. For more on this type of fruit – a drupe – see last year’s post on peaches. Raspberries seem hollow because their receptacles stay behind on the bush, and the drupes cohere in a beautiful jeweltone dome. Blackberry receptacles are harvested and eaten with the rest of the fruit. Strawberries and caneberries use different strategies to the same end, but both are effective. 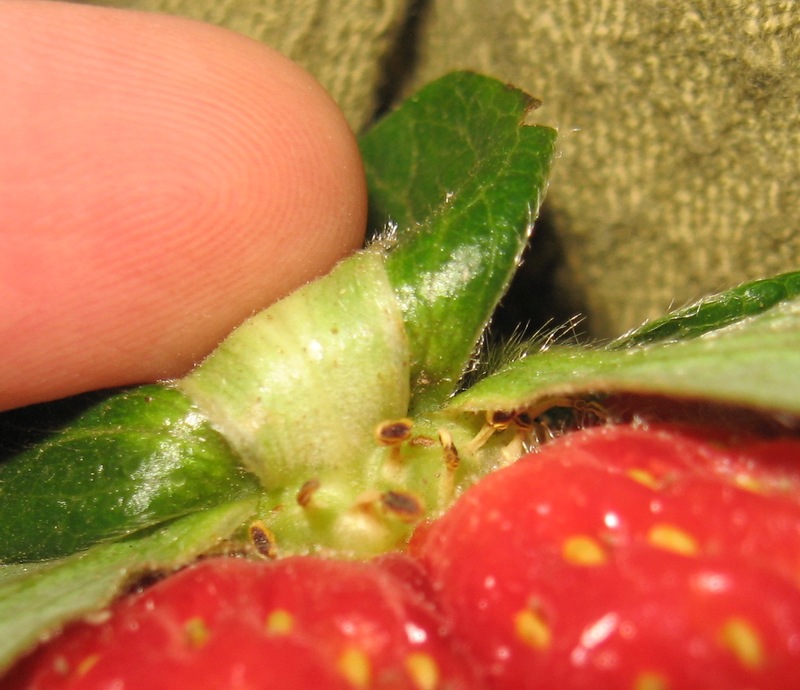 Whether it is the receptacle of the strawberry or the drupelets of the caneberry, a sweet and fleshy structure attracts and rewards seed dispersers while a small hard covering – the achene wall or the drupe pit – protects the actual seeds against being digested. Many people will have already heard that strawberries are not berries, but what is a berry? A berry-type fruit is fleshy throughout, without any hard or papery bits such as the pit of a drupe or the papery insides of an apple. Grapes are berries, as are persimmons. Other familiar berries include eggplants, green peppers, and tomatoes. Avocados are debated but seem to me to fit the definition. Olives are not berries because their seed is inside a pit. They are drupes, like peaches, plums, and cherries. Interestingly, pineapples – which are obviously neither pines nor apples – are true berries. The large spiny yellow-green structure is an aggregate of berries, buried down into a flowering axis. Although both parent species of our current strawberry came from the new world – the previously domesticated F. chiloensis from Chile and F. virginiana from the eastern U.S. – the first hybridization happened in France in the 17th century. This may be why we so often associate strawberries with France. The original French strawberry, the fraise de bois, was very popular until it was replaced first by F. virginiana and then by the hybrid pineapple strawberry. It is interesting enough that Captain Frézier was predestined by his family name to be the father of the modern strawberry, but it might be even more so. One story holds that in the early 10th century, a French nobleman hosted a feast for King Charles III of France and an Italian Cardinal, who were traveling together. The nobleman ended the meal with a simple plate of perfect strawberries, which so impressed the king that he gave the nobleman the name Frasier and a coat of arms bedecked with strawberry blossoms. And what was the nobleman’s original name? Julius de Berry. J.F. Hancock, J.F. (ed.). 2008. Temperate Fruit Crop Breeding, SpringerScience+BusinessMedia B.V.
Janick, J. 2005. The origin of fruits, fruit growing, and fruit breeding. Plant Breeding Rev. 25:255-320. This entry was posted in Fruit, The basics, Uncategorized and tagged fruit structure, Katherine Preston, morphology, Rosaceae. Bookmark the permalink. How wonderful! This should be required reading for anyone who ever ate, or even saw, a strawberry. Once again, I have enjoyed your take on food and am now informed that ,as I always suspected, ” You’re the berries!! !” Ha! Since the many pistils come from a single flower, they technically produce fruitlets, e.g., achenelets, drupelets. Picky, picky. Now on to pineapple! Of course you are right, and I’m sorry if my usage was irritating like a little blackberry pyrene stuck between your teeth. 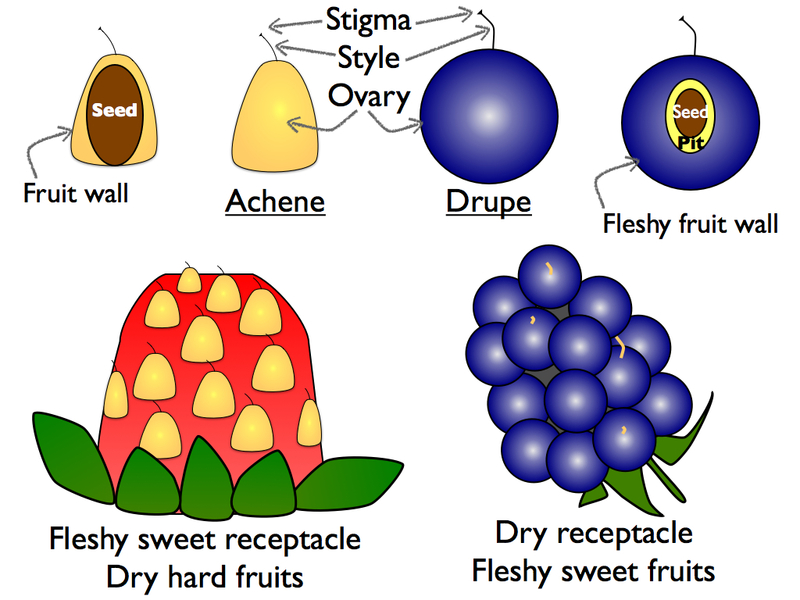 You’ll note that I do use the more specific term in context (“Whether it is the receptacle of the strawberry or the drupelets of the caneberry…”) but for clarity (and comparison with plums) I mostly use just “drupe.” The Angiosperm Phylogeny Website does not include drupelet in its glossary, and I didn’t want to confuse people too much. I only wanted to confuse them a tiny bit. Thank you for pointing it out for those who can handle it.